Abstract Finance: Are You a Compulsive Shopper? Differentiating what you want and need may be a really difficult endeavor, especially if you are a compulsive shopper. In being a compulsive shopper you have a weakness in wanting to shop. 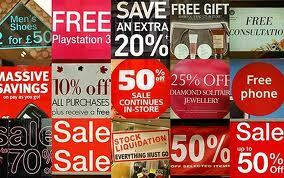 A good way to save on money is to shop in places that have sales and discounted prices. This will go a very long way in saving you some money as the clothes, gadgets and other items are cheaper than originally priced. It is a best of both worlds situation that you are able to obtain what you desire and save a little money while spending. Looking for places that have sales and bargained prices are an efficient way to save money. It is a way for you to be able to buy certain items while saving money as those items are cheaper than originally priced. You may also get selected items at a buy-one-take-one rate which will allow you to have more than you planned for. You will be able to give these buy-one-take-one items as a gift for your loved one, friend, or family member. In shopping in places that are on sale, the money that you save may be used for a vacation fund that you may use to visit places and countries that you have never been to before. You will be able to experience the various cultures and wonders that the country has to offer. It is a worthwhile endeavor that will allow you to discover more about yourself as well as the country that you visit because you mind and outlook becomes different when you visit other countries. You become a more cultured person as you save from buying in places that have sales and discounted prices.